The gimmicky title implies a SHARKNADO-style camp fest, but the grim reality is a talky, embarrassingly self-serious misfire that opens with a quote from the Book of Revelations alongside portentous sub-GLADIATOR music. Thereafter, we witness the discovery of over-sized bees in a Nigerian forest and are given a vague idea of the atmospheric catastrophes leading to worldwide civil unrest. Cinematically, this means crappy CGI exploding helicopters and duff actors muttering about the End of Days. An L.A. quake heralds the eponymous swarm, and one character muses that the deadly bees were sent by God because he’s “angry”. (Looks to us like they were sent from a rejected early 1990’s videogame). 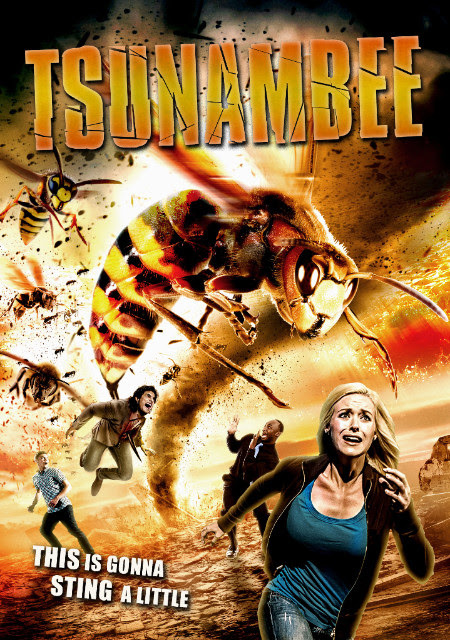 BIRDEMIC-style bee animation aside, the movie is played boringly straight and devotes most of its running time to heavy handed attempts at character-based drama and tension. This means a tendency for pace-crushing speeches and monologues, notably from Sheriff Stacy Pederson, who has “lost three partners…all of them stand-offs…” and isn’t shy about telling everyone. You’ll end up sympathising with the bees, who are often forgotten about in this lifeless snoozer, where even a sub-plot about the victims returning as zombies (zombees?!) fails to perk things up. Only good news: it’s shorter than you think, given that the end credits take up more than 10 minutes of screen time.